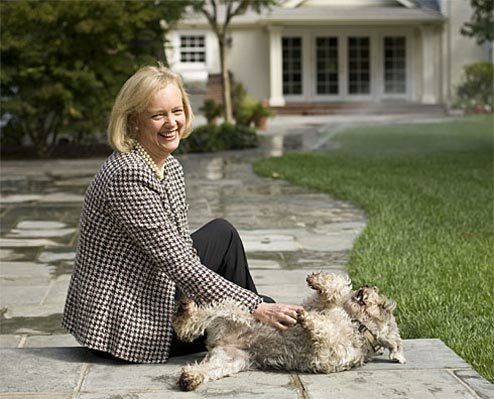 Why I don’t like Meg Whitman. 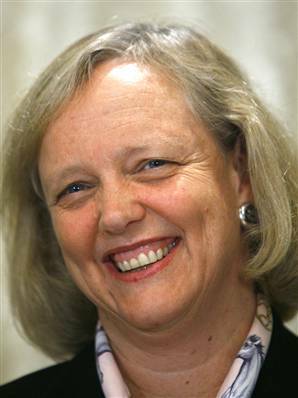 I will not vote for Meg Whitman as Governor of California. I simply don’t like her. I can just imagine working for her. She would be the boss that always has a painted on smile, and conducts sales meetings in motels, and talks for six exhausting, oxygen starved hours in front of thousands of co-workers, inside a windowless catering hall, motivating us. She looks haggard, but she probably is the type who functions on two hours of sleep a night. She is a go-getter, a type “A” workaholic, a sports fan, a rabid investor, a fearless leader, a hardscrabble boss, a fast talking, on her feet, off to the meeting, back from a conference kind of gal. Her life reads like a human resources written cover letter of verbs and action words: controlled, managed, delegated, reorganized, instituted, increased, launched, negotiated, resolved, restored, facilitated, directed, encouraged. And if we elect her in California, we too will experience action words and verbs: fired, lost, cut-off, investigated, deported, economized, downgraded, downsized, exported. The rich will applaud and tell the rest of us that it is all meant for our own good. If I did work closely with her, it would be in some demeaning capacity, like that maid she fired who “was almost a member of my family”. If she did take notice of me, it would be to pat me on the back for something ridiculously low, like sweeping her back porch, or organizing her recyclables. 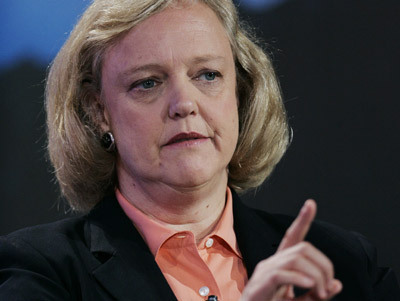 I don’t like Meg Whitman, and if I did work for her, you can be sure that she would fire me. 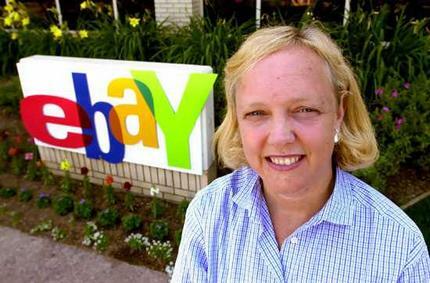 She wouldn’t personally fire me, but she would order a “company wide cutback of 15%” that would involve firing hundreds. Someone that looks just like her, in human resources, several thousand rungs below Meg, a woman of about 40, in a blue JC Penney suit and frosted spiky blonde hair would do the layoffs. Meg has billions and she has spent $120 million dollars to buy herself the governorship of the state of California. But there are millions of voters in this state who look at Meg and see that bitchy boss, that speeding woman in the SUV in the rear view mirror, that insurance company clerk, that mean math teacher, that ornery and self-assured Auntie, that bossy wife, that executive suite President whose office is on the top floor of a skyscraper in Century City….and they just don’t want to elect her to give her one more feather to put in her 10 gallon, eBay sized hat. 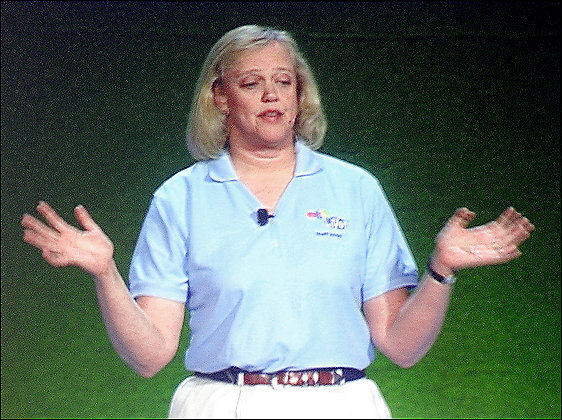 I don’t like Meg Whitman. I don’t care what she says. I don’t care what she spends. I ain’t voting for her. I had thought this, but think you articulated it well. I don’t like her either. And Carly neither. They just seem like people out there that I detest. I wish Meg or Jerry would address the everyday important, life-or-death issues, like, why is it that people (in LA) like to shoot others at taco stands or around taco trucks? Is it the economy, stupes? I totally agree…she’s a big phony! That picture of the Michigan central train station is a taste of what California will become with Meg in charge. Actually, she won’t be in charge, we’ll be ruined by big oil, big energy, big drug cartel, and corrupt local city officials. ← Infrastructure Photos from Around the World.